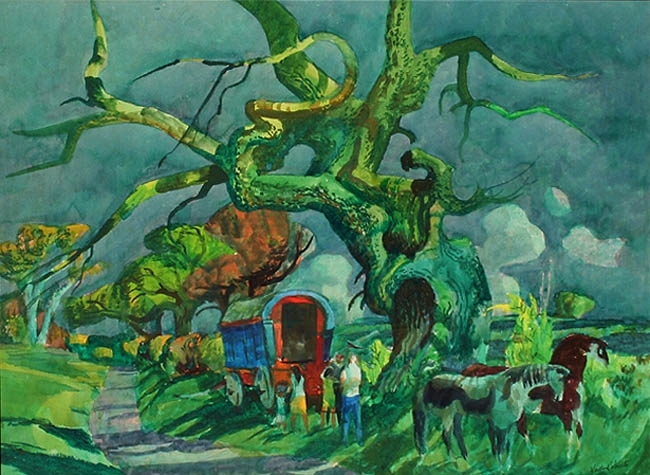 “Gypsy Camp, York, England” is an original watercolor painting created in 1967 by early California Modernist/Depression-Era artist Millard Sheets (1907 – 1989). The work measures 22 x 29.5 inches unframed, and 28.5 x 36 x 2 inches in a brown frame with off-white matting and plexiglass. The painting is signed by the artist lower right. This is an excellent example of this artist’s California Modernist style. 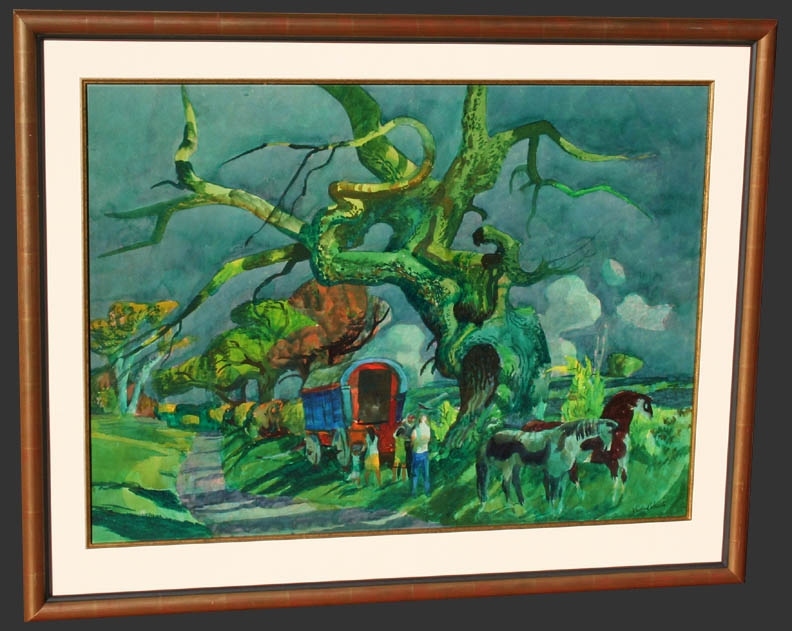 The work features the typically bold colors seen in his paintings that were created after the 1950’s that often showed subjects from his travels, such as this English scene. This painting is in excellent, mint condition. The plexiglass has some minor scratches. Millard Sheets was one of the foremost watercolorists of his era, known for his landscapes and urban scenes depicting people of humble circumstances, particularly during the Great Depression. He was born in Pomona, in Southern California in 1907. In addition to his successful career as a painter, he also worked as an architect and mural designer. Additionally, he made tapestries and mosaics, including the mosaic dome and chapel at the National Shrine in Washington D.C., and murals for the Los Angeles City Hall. He was a student at the Chouinard Art Institute in Los Angeles prior to working there as a teacher. He later was Chairman of both the art departments at Scripps College in Claremont, where he worked from 1954 to 1960. He was a member of the California Watercolor Society, the California Art Club, and the Bohemian Club in San Francisco. His paintings can be found in the collections of the Metropolitan Museum of Art and the Whitney Museum in New York, the Chicago Art Institute, the National Gallery in Washington DC, the DeYoung Museum in San Francisco, and the Los Angeles County Museum.